Burgiss will headed to his new home in Utah within the next week or so. Rebecca has given him the new barn name of Fergus which suits him perfectly 🙂 I’m super excited for both Burgiss and Rebecca because they are going to make an awesome team. Burgiss will be thrilled to have a one person home. 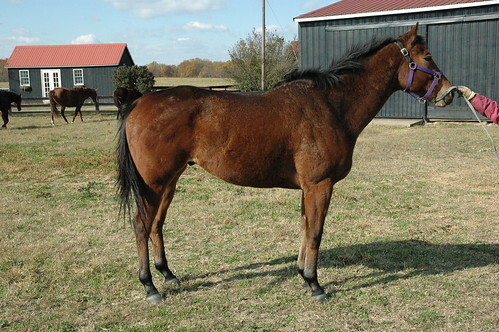 He is a horse that loves having his own person and I know he will be loved in his new family. I am sure we will continue to get lots of updates on his progress. I am now starting to get excited about my new project. I think I will be bringing Areutrue home with me. He is super sweet and lovely. Excited!!!! It’s a rainy day here in Delaware. I’m sitting here thinking about the upcoming shopping season and trying to figure out what I might like for Christmas. Kurt wants a list and I really have no clue what I want. My favorite things are stuff for the horses- bits, bridles, blankets and other essential items. I have been organizing my tack rooms (um, I have a whole room in my house for tack) and I realize that I need to cut back and not add to my pile of tack 🙂 Why do I keep looking at ebay then???? As I procrastinate on my actual work that needs to get done I was reading one of my favorite blogs and came across her great article on customer service- http://www.trumbullmtn.com/2011/09/customer-service/ I have never shopped with Trumbull Mountain but I really enjoy their blogs about saddle fitting and I have heard great things about their service. It started me thinking about the companies that I really thing provide excellent service. Do you have companies that you really love to support? Stores that you prefer to buy from? Good customer service is really important to me and I have no issue spending more money to get good service. I will also avoid any companies that I don’t believe give good service. For gorgeous tack you must shop with Five Star Tack http://fivestartack.com/ Jaime donated some amazing bridles to CANTER and supports several thoroughbred rescues with part of her proceeds. I emailed her recently looking to buy some horse size browbands for the cob bridles that she donated. Most of our guys tend to have heads that are between cob/horse so bridle fitting can be a challenge. Jaime got my email and looked to see what she had that would fit the bridles she donated to us and then sent me two browbands for free. I was very willing to pay but she insisted that we have them. I have bought several bridles from her but I will continue to support her business because the customer service is top-notch and I really appreciate her support of the various thoroughbred retraining groups. I love shopping with Smartpak. I think their customer service is always amazing. I could say the same for VTO Saddlery. Kurt and I had a super trailer buying experience with Risa at Happy Trails Trailers http://www.happytrailstrailers.com/. She spent a lot of time going over all the options and listening to us to figure out what exactly we wanted in a trailer. We drove her crazy with all of ou questions and she was so patient. Kurt and I have some serious love for our trailer. We never met Risa in person and the trailer was built and shipped to us but we felt comfortable with the long distance transactions because of her great service. My local Amish tack shop (Mast Harness) is a staple in our community and I have been shopping there since I was a kid. They are always willing to help me out when I go in there with things that I want but can’t find. I also get all my lead ropes and lunge lines made there. My hay guys are the absolute best (no, I won’t share their info with you cause they are my secret :)) and I adore them. They are older farmers who have been in the dairy business and now beef cattle. They have went above and beyond for Kurt and I so many times. They are the type of people who will bring me hay knowing that I can’t pay them right at that moment and they tell me not to worry because they know that I am good for it. They have beautiful hay but they give us a great deal and they always call to check in with us to see if we need anything before winter comes. To be in a customer service job you truly need to truly like people and truly want to help them … not because it’s your job and you get a pay check at the end of each week, but because it’s the right thing to do. The best thing about my job is that I know most of my customers truly appreciate my efforts and take the time to say so in a note or email long after the sale is finished. When people are treated with honesty and integrity it usually comes right back to you. Something that I learned very early on in the horse business was that good customer service is what allows you to be successful. The horse world is such a small world as we all know 🙂 It seems as that though we are all interconnected no matter how far away we are from each other. If you always go above and beyond to provide good customer service than the word gets out and you will continue to have success. Your reputation will build through that good word of mouth and new customers will seek you out. I think that those of us at CANTER have seen our resale program take off because of the customer service that we try to provide to each of our potential buyers. You know that you are doing a good job when you have all your customers commenting on your blog about their wonderful horses and then they go and tell all their friends about how awesome the CANTER program is 🙂 That is a win for everyone involved. It sure makes me feel appreciated and I thank all of you for your comments and updates on your horses. They will still all be “my horses” because each horse that comes into our program will always considered part of the CANTER family. If you see a CANTER volunteer walking the backside of the track please stop them and say thank you. I can’t tell you just how much all of the CANTER volunteers give to this program to ensure that horses end up in good homes. Our resale program is just one small component of what we do. We place so many horses through our track listings with the help of the many volunteers who give up their weekends to walk the track. I have some amazing volunteers at Delaware Park who bust their butts to help the trainers. I know our other tracks have equally amazing volunteers helping out. I always think a thank you goes a long way to making sure everybody feels as though their great customer service is appreciated. I think I will be sending some emails out today just to let people know that I appreciate what they do. Rebecca and her friend Dee came all the way from Utah and they were my kind of people. Just super nice people who are down to earth and easy to work with. We spent Friday evening riding in the ring under the lights. We rode in the ring a bit more on Saturday. During our ride, two trailer showed up and unloaded four horses. Amy who bought Auto Pilot and Michelle who bought Rustyshouldrun came over with some friends to ride. Burgiss didn’t seem to mind the added chaos. We then headed out of the ring to go on a little trail ride. I probably scare people with my version of trail rides but it gives them a good opportunity to see the horses in all situations. We hacked down the road where the cars don’t really slow down or give you much room. Then we went out into a big open field where we saw a hunter..uh oh! Stay away from that part of the woods. We had a little trot around but it was pretty muddy. 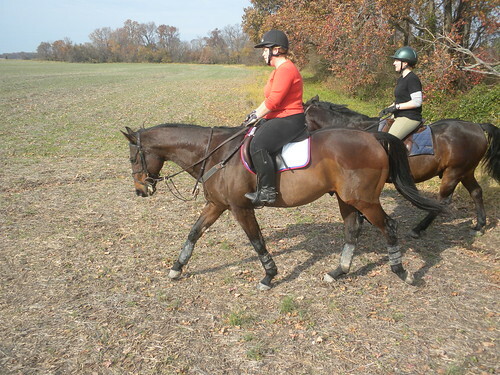 We jumped a little natural ditch and then we all had a canter as we headed back home. 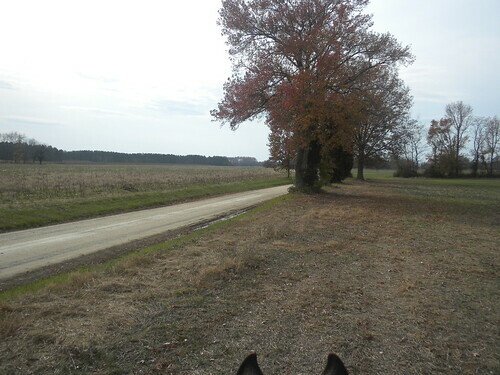 Hey, it was the driest spot 🙂 Dee was riding Junior who is always a bit of a fire-breathing dragon on the first canter and I rode Bear who is some sort of morgan/qh/mutt mix that is owned by my boarder. Dee and I were making our horses behave but Burgiss was being his normal good boy self just cantering along oblivious to the fire-breathing dragons beside him. We practiced going in and out of the water filled puddles as well to show off Burgiss’s water skills. 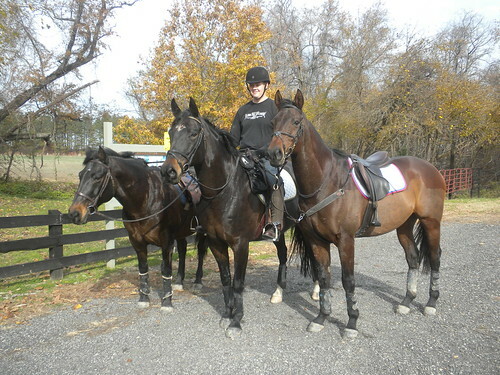 We decided to have a nice relaxing Sunday and went to Wye Island for a trail ride with our boys. 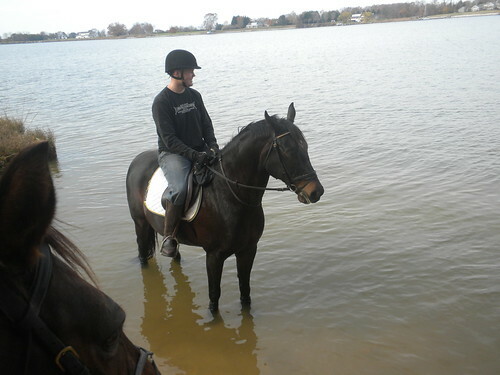 Wye Island is a beautiful place to ride and there is even a little beach you can walk down on and take the horses into the water. How cool is that! I hadn’t ridden Letterman all week due to rain/busy schedule. One of the reasons that I bought him was that I don’t have to worry if I don’t ride him everyday because he is always behaved. I really have no goals for him so if he’s just my weekend trail horse so that Kurt and I can go out and have fun than that is plenty good enough for me. Both Junior and Letterman were a wee bit excited when we got there because a whole group of trail riders had pulled in and were going out for a group ride. I am always impressed how Letterman handles himself. He was nervous but he stands much quieter for me to tack him up than he used to. Junior was being much worse 🙂 We got on and immediately had a trot to let them blow off some steam. Amy was riding out with us and even her guy was all puffed up. We had a lovely 2 hr ride where we had awesome trots/canters/gallops across the fields just enjoying our nice horses. Junior always has had the cutest face. I was slightly surprised that Letterman took so easily to the water. It’s pretty scary to be in this much water but he really didn’t seem to mind. He’s very trusting which is cool. It really was an amazing weekend topped off by a great Ravens game! I was sitting down yesterday thinking that these people that buy horses from us all become friends. Just this week, I had gotten emails from several people who bought horses from me as well as a visit from two of my buyers with their horses. They just love their boys and it makes me so thrilled to see them jumping around courses grinning from ear to ear. Allie posted something on facebook about her horse being the BEST (Track’s Protege a CANTER horse from Delaware Park) and so many of our CANTER buyers were on there arguing that THEIR horse was the BEST 🙂 If that doesn’t make you smile than I don’t know what does. I find it very easy to sell these horses that I get so attached to when they all have great homes with people that love them. It makes me energized to keep going. Shine my Shoes, Diamond H, Bushy’s Yield, Rockin Fun, Letterman’s Humor, Rustyshouldrun and Auto Pilot all sold from my barn so far this year. 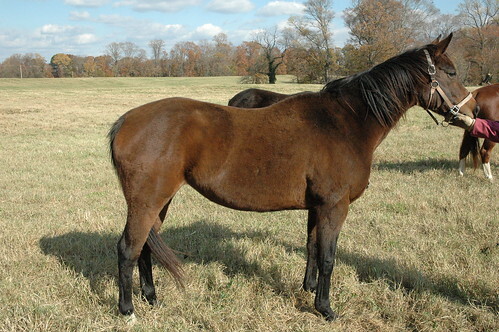 I sold Hold that Halo, Dance with Bill and Esstoga Tune out of the field this year(not our norm). Mort Robbins and Cool Casey started with me but ended up down in North Carolina and were both sold. In an interesting turn of events, Mort had slipped and tweaked his stifle right before his vetting and didn’t pass. 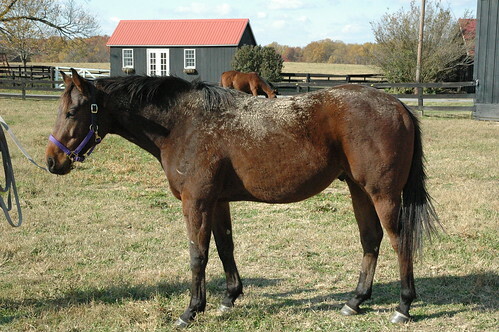 He just needed some time to rest and when he was ready he went down to North Carolina because my barn was full at that point. He was bought/vetted by the same person who had vetted him the first time 🙂 I think we will hear some big things about him in the future! What a busy year so far! I had a good chuckle this morning as I triggered a funny memory from our last xc school. 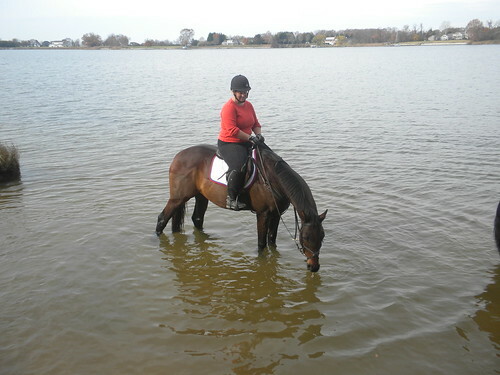 I had walked Burgiss down to the water which is a fairly long walk from the main xc field. I love how brave he is and he just walked along checking out the sights. We had walked around the approach to the water and that is where the injured rider was so I turned around and was headed back out the xc field. A few days later I am riding him in the ring just cantering around when boom the lights go out and we are now in the pitch dark. That didn’t phase him at all and he just went about his business like a pro. What a good boy! I had missed a few days a riding this week due to the rain and he has people flying all they way from Utah tonight to see him. I was determined to ride him last night even if it was raining and cold. I know he would be just fine even if I didn’t ride but showing horses to people stresses me and I like to be prepared! The temperature has dropped 30 degrees and they haven’t been turned out into their regular fields due to the wet conditions. It’s cold, dark and spitting rain with high gusty winds. My ring has a line of trees on one side because the tax ditch has grown up. The State used to cut the tax ditch but for whatever reason they decided not to cut our side of the ditch last year and the trees/bushes grew up down the whole length of our property. We need to cut all the trees down but finding time to get that project done is hard to do. The horses can be really really bad about the blowing trees/leaves/bushes on that side of the ring because they make a ton of noise when the wind blows. I swear every time I go out to ride the wind kicks up and then when I get done the wind dies down. I think nature is testing out how well I can stick on horses sometimes 🙂 The lovely thing about Burgiss is that he just doesn’t get stupid about that side of the ring. An occasional spook here and there but riding in the dark with cold wind blowing is going to result in a few spooks because it is pretty damn scary out there. I had such a lovely ride on him last night where his back was loose making his flat work feel great. He jumped soft and relaxed cantering away on a loose rein. There were a few times the wind gusted up and blew the trees so hard that even I was spooked but he just had a little look and kept on going. He couldn’t have went any better so I hope that continues over to tonight’s ride for my horse shoppers. St. Augustine Pony Club opened their course for xc schooling for the next few Sunday’s. It was a gorgeous day so I took Letterman, Burgiss and another horse along. I started out with Burgiss and I was supposed to school with my mom but she was running late. Burgiss is always really quiet and he walked out to the xc field very nicely leaving his two buddies who were still on the trailer. I would say it wasn’t our best ride simply because he was distracted. He didn’t do anything wrong but his focus wasn’t as good as I think it could be. I thought he could have been a bit more relaxed over top of the jump but instead he was jumping them really big again. I’m not going to worry about it though because it’s simply an issue of mileage at this point. We were just getting going when somebody took a bad fall and all the emergency vehicles started to come in. I was pretty much finished anyway and I jumped a little mini-course and then headed back in right as the helicopter landed in the middle of the xc field. There is absolutely no doubt in my mind that Burgiss had one of those brains that I truly appreciate. It was a windy day, he was away from his buddies, lots of stuff to see and helicopters/emergency vehicles all around and he was just ho-hum about it all. Letterman was next up and although he has done some paperchasing and hunting this was a new experience. I think one of the big differences at a xc schooling is that you have horses going every direction at different speeds and there is just so much to process for horses. When you are paper chasing or hunting you have a buddy for them to rely on but xc schooling they have to be a bit more independent. We went out with my mom on her 3yr (the chestnut in the video I will post) and her guy was a bit up. I was basically keeping him company for a bit and although Letterman was pretty high on life he was keeping himself together. You can see that he basically has his tail over his back a few times and he was pretty impressed with the atmosphere but he never does anything wrong! My mom almost ran into him and then flew right by him and he was quite good about it all. That is why I love him so much! I think when horses are geared up it’s easy to make things go wrong. I am a believer in just letting them go forward. I was helping my mom with her guy and trying to focus on Letterman at the same time but the theme was just go forward. Don’t worry about the head because you don’t want to pick a fight or restrict them until they do relax. I like to just get up out of the tack and have a good canter letting them stretch their backs and get all the silly out without pulling on them. I have my hand in my neckstrap almost all the time at first just as a bit of an anchor. Letterman is pretty nice to ride because he really listens even when he is excited. You can half halt and soften him to help him focus. He always is trying to be right there under me and I appreciate that! I do a lot of circles, figure eights and transitions to get him zoned in on what we are doing. He settled in really nice as we got going. I only jumped a few fences because I really didn’t want to overwhelm him. It’s important to make it short and sweet the first few times so that they can process it all. Just because you can go out and jump everything doesn’t mean you should! He is still learning his footwork but I was happy with how confident he felt. I lunged the other horse and he was really good. He was just there to see the sights. I asked about the rider who got hurt and they said she was going to be okay. We were all glad to hear that the helicopter was mostly for precaution. I had a nice ride on Letterman and Burgiss last night. In the middle of cantering Burgiss down the long side of the ring, the lights suddenly went out and I found myself in pitch black. Burgiss didn’t seem to skip a beat but I was hollering for Kurt to come and help me 🙂 Never a dull moment on the farm! Freezing cold with 30mph winds doesn’t make for the best day to go try to lunge horses in wide open fields but they don’t call us team bad decision for nothing 🙂 I so love my trips out to the farm to visit all of our horses. The majority of horses that we get donated are absolutely lovely 100% sound horses that are just too slow or the occasional horse that has an injury that good old rest can heal (mostly bows). We can’t really take many horses that can’t be turned out in big fields and our budget is very limited so we try not to take horses that we can’t rehome. Most trainers know us very well and know that we do an amazing job with our horses so they are willing to donate rather than sell their nice horses. They all get quality time out to just have some R&R and then get several months of retraining which guarantee them a very good shot at finding forever homes where they will be valued in today’s market. 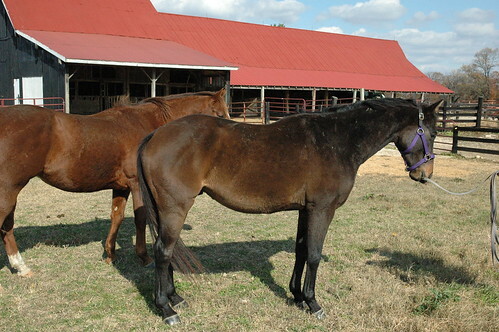 They money from our sales goes right back into the program and we are able to rehome a high number of horses because we keep moving our horses into homes. 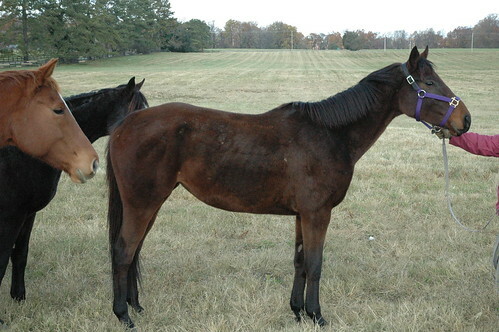 It’s really fun to see the horses that I knew at the track now at the farm. Sometimes it’s hard to even recognize them. Right now we have a ton of bays who all look-alike. He was so good to lunge because he was our first we lunged him in the huge field. After we lunged him the rest of the horses gathered near the small paddock and we shooed them into there. So much easier than walking out into the 30+ acre field to individually lunge them. Next up is Pegasus Fever aka the Big Beast. He is a tank! Not only is he big around 16.2-3 but he is enormously fat. http://www.pedigreequery.com/pegasus+fever Pegasus is the resident pest who follows you around getting into all your stuff. He picked up halters, the lunge line, the lunge whip and was getting in all the pictures we were trying to take. 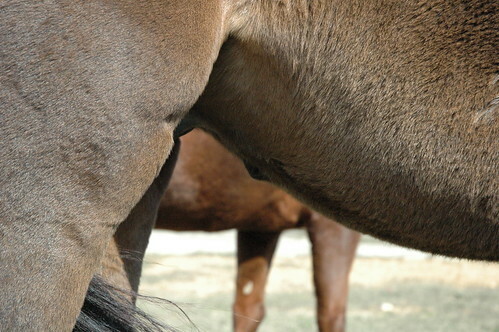 This horse has a larger than life personality. 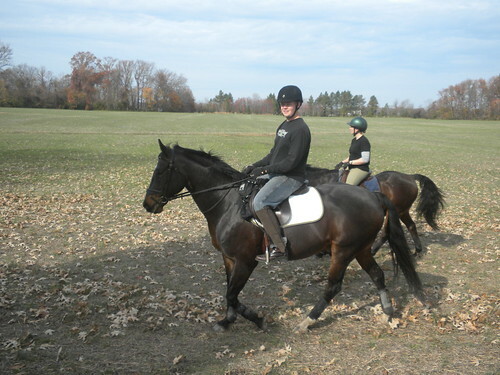 He has an old knee so is sound for trail riding and light work but not a competitive career. I need to get him a home because he really wants his own family. Next up is Areutrue. 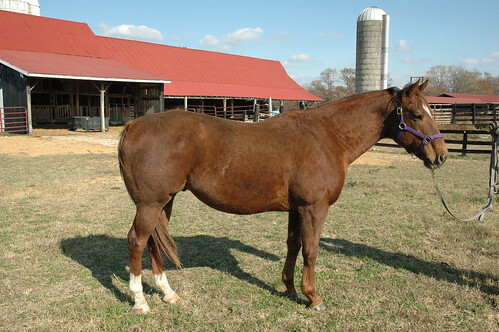 He’s a lovely 7yr gelding and is sweet as they come. 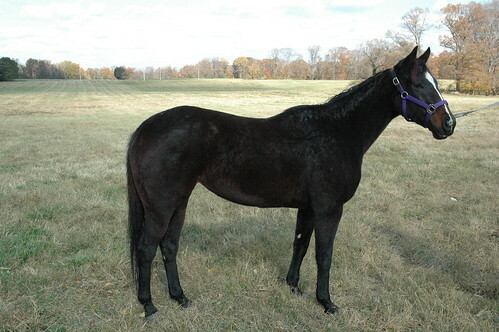 Next is London Lullaby http://www.pedigreequery.com/london+lullaby and he is my favorite of the bunch. He’s a 3yr and is just such a little pest. Same in your business type of personality as Pegasus. He couldn’t keep the lunge line out of his mouth. This guy is lovely and boy oh boy can he move. 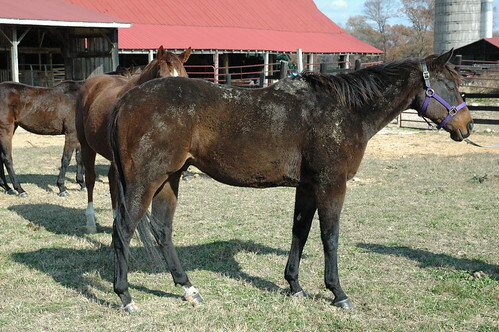 He has this tiny hernia which is something that I haven’t seen on a horse before. The good news is that it is quite small and getting smaller as he gets older. He had no clue how to lunge so it was quite the production. We got it sorted out using the corner of the fence as a guide. Next up is Sweeter than Fudge http://www.pedigreequery.com/sweeter+than+fudge who is an adorable 2yr who is quite big already with big bone and big feet. He is such a kind horse and I think he is going to be quite lovely. I imagine he will be huge when he gets done growing. This last guy just arrived this week from the track. His name is Derick Hand and he is a big 4yr probably around 17h. We then headed over to the mares field. 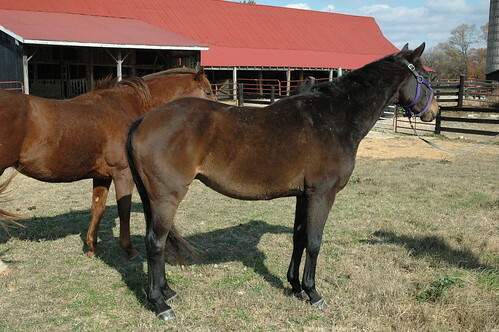 We have four mares right now as our farm doesn’t have much room for mares so we keep our numbers low. Wonderful Wise http://www.pedigreequery.com/wonderful+wise is one of the horses that we have had the longest amount of time simply because we have haven’t had a chance to get her into retraining and then a month or so again she slipped in the field and pulled some muscles in her hind leg and the swelling caused a huge hole in the leg that drained for weeks. Poor girl has had to have lots of antibiotics and flushing and she still likes people! The next two are recent arrivals. First up is Her Way’s Okay http://www.pedigreequery.com/her+ways+okay she is a pretty girl! Last but not least is Dazzle and Shine. 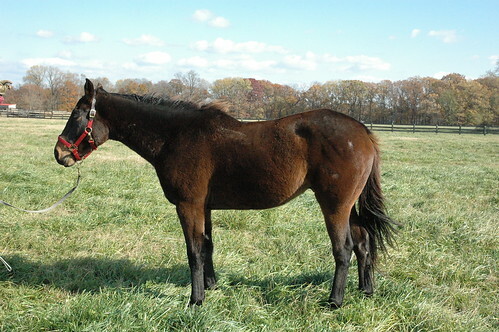 http://www.pedigreequery.com/dazzle+and+shine We had another horse by Grindstone and he was one of my favorites. Dazzle reminds me so much of him! She needs to put on some weight and muscle but I think come spring she will be absolutely lovely. She is very athletic. There are even some videos of this crazy production. 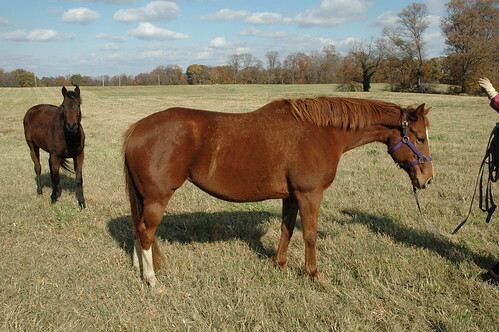 Here are the geldings. The only horse that I didn’t get pics of was a new horse named Bigbossman. He wasn’t feeling very social as he has just arrived. It’s normal for them to be anti-human for a bit. I’m back home to ride my crew in this lovely wind. I’m just catching back up with work and home life after being in Kentucky for the past week. CANTER was having their national meeting around the Breeders’ Cup races and Allie invited me along. It was really beneficial to sit down with all the other branches of CANTER across the country and share ideas. We discussed what is working, not working, how to grow our brand, how to fundraise and how to promote our horses. There was a lot of talk about the CANTER business model and how do we operate on a limited budget. Some branches of CANTER only have a track listing program and some have both track listings and take donated horses. 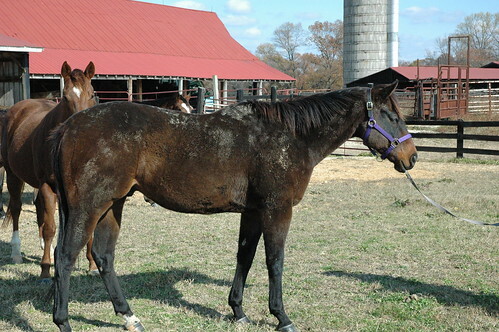 Those of us who take donated horses talked a lot about how to make the program work. How do you decide which horses to take? How do you find farms to board the horses? How do you find trainers to do the retraining? How do you pay the farms and the trainers? What should our sales contract look like? How long can you realistically track the horses for? It seems like we are the model in terms of our retraining program. We take in upward of 50 horses a year on donation and have a ton of success at retraining and selling the horses into new homes. Allie and I talked about how retraining adds value to the horses and ensures that they end up in the right homes the first time. When horses have retraining they have much better odds and landing in a good home even if they are resold down the road . The retraining program also works as a marketing tool for us because everybody who buys a CANTER horse tells their friends, trainers and everybody else where they got their horse. Horses are sold for decent prices because we are putting a quality foundation on them and when they are sold that money returns right back to the program. I would never say we make money in the long run but we do return money to the program which is very important. As passionate as I am about retraining it is also clear that track listings are very successful! Now on to the racing! If you have never seen a big race in person then add it to your bucket list. Wow, talk about thrilling! Not to mention the horse-flesh. Every horse was nicer than the last. All of us would sit there and watch the post parade and pick out our favorites. 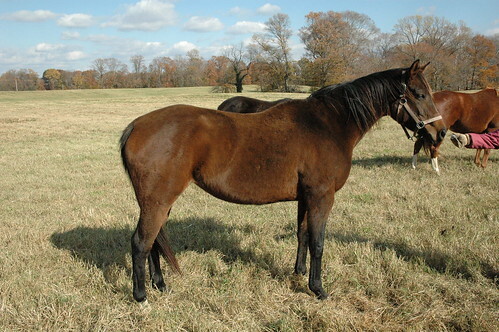 I love looking at the breeding and thinking about which CANTER horses had similar breeding to the horses that were racing. 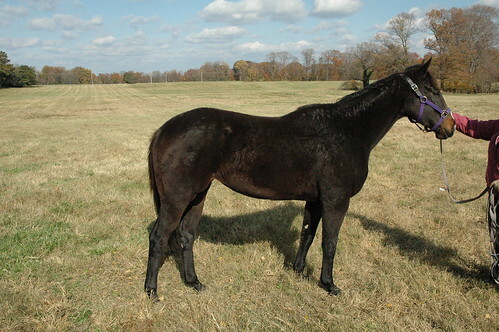 Of course now that I own a horse sired by Distorted Humor I had to check out all the other Distorted Humor horses. More on that later…. We had amazing seats right near the winners circle on the rail. Seriously, it doesn’t get any better than that! You could just feel the horses thundering down the track. Absolutely amazing. We were there both Friday and Saturday. The track was really crowded on Saturday and there was just a different feeling. It was neat to see the famous horses in person and not just on tv. I was rooting for Goldikova and Havre de Grace just because they had this swagger about them. In the final race, the Breeders’ Cup Classic, there was a horse by Distorted Humor. I watched him in the paddock and he just had a tough look about him. Looked like a runner. I should have bet him as he was a 14-1 shot but I am not much on gambling. Wouldn’t you know Drosselmeyer came flying by the rest of the field and won the Classic. Wow, it was just an amazing race. On Sunday, we went to Lane’s End Breeding farm. 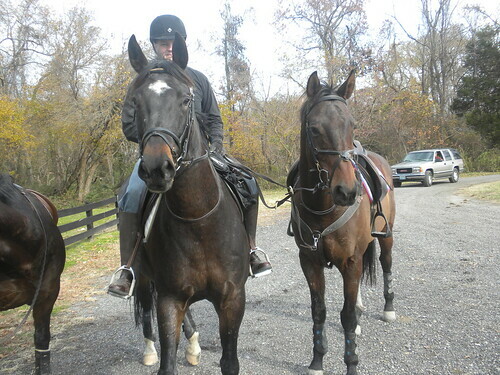 I had been out to Lexington, KY for Pony Club stuff years ago but never got to go and do all the fun stuff because we had to stay with the horses. What a treat to walk through the amazing barns and see all the stallions. They brought many of them out so you could look at their conformation which I enjoyed. Rock Hard Ten and Quality Road were my two favorites. Absolutely gorgeous! We drove around to see all the farms in the area and then went to the horse park to watch some of the Maclay Finals. Gorgeous horses and amazing riders but slightly boring to watch. We finished off the day with a pedicure and Ravens vs. Steelers game 🙂 Ravens rule! Now it’s back to work and riding in the dark under the lights. It was gorgeous to ride in the warm weather under the full moon last night. I took some video of Burgiss but didn’t look to see how it turned out. It’s hard to video even when the ring is lighted. He has some special people flying in to see him so I am crossing my fingers it goes well.